Welcome to spring. Its time to think about getting your patio and patio furniture ready for an enjoyable summer. That means its time to order outdoor replacement cushions for your furniture to replace those old and worn out cushions. Taking a little time now picking out fabric and ordering cushions will pay off because it will ensure you receive custom made cushions in time for summer and use them on your patio. Whether you have tufted, foam or deep seating cushion sets, careful inspection of your existing cushions will reveal whether you need new cushions or not. You need to look for the aesthetics as well as functionality of a cushion. They need to look and feel good. First look at the shape. Misshapen cushions can make furniture look undesirable. 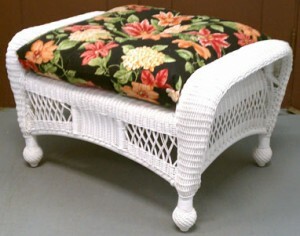 Cushions should hold their original perimeter shape for the furniture. The seat cushions have a purpose and thats to cushion your seat. So, there should be sufficient padding in the cushion to make your seat comfortable after sitting for 30 minutes. Similarly, back cushions should be soft to comfort your back not be thin and bumpy. Cushion fabric should be clean and not faded out. Seams and fabric should be sewn closed with no loose or frayed ends. If any of these issues are a problem for you, then its probably time to buy outdoor replacement cushions for your furniture. If your a person that takes care of their cushions and puts them away in between use, then all-weather fabric is a great choice for you. All-weather fabric, also known as spun polyester fabric and its a print. That means inks are used to print the patterns or colors on the polyester fabric. Spun poly is available in an enormous selection of various patterns and solid colors. Its one of the most economical fabric selections for outdoor cushions. Water won’t bother this fabric. Over a long period of time in direct sunlight, it will begin to fade. But if you either keep the furniture covered or take the cushions in side or store them out of the direct sunlight when your not using the furniture, they will last a long time without fading. Sunbrella fabric is the premium choice for outdoor replacement cushions. Sunbrella is an acrylic fabric which means that its water proof, the color of the yarn that makes up the fabric has the color blended within it along with ultraviolet inhibitors that keep the fabric color from fading or deteriorating. In general, the color won’t come out under normal use or cleaning and the fabric will last a very long time. The selection of patterns is not as large as all-weather fabric, but is a superior fabric for outdoor furniture cushions and the most desirable to use in the sunbelt. If you live in the south where the sun is relentless, use Sunbrella fabric. Once you have found the right fabric, place your order so that you can receive your new cushions in time for the summer.